Transekur is well-known for the executive protection Dominican Republic services we provide to our clients. Part of what makes our executive transportation Dominican Republic professional grade is the top level security and highly trained security professionals we include in our executive protection Dominican Republic services. Security risks and potential threats have risen throughout the country, even in popular areas such as Punta Cana and Santo Domingo, but Transekur is more than prepared to handle any situation that may cause harm or put any one of our clients in danger. Despite rising risks from potential hazards such as robbery, roadside dangers, or other unfortunate events, Transekur has a staff of elite armed and unarmed security professionals that provide a level of security unrivaled by any other transportation company in the country. Our executive protection Dominican Republic staff members have years of military and private protection experience that makes them some of the most qualified security personnel on the entire island. Our experienced staff, high-quality vehicles, and exceptional service are what make Transekur such a highly respected executive transportation Dominican Republic company. Celebrity and VIP protection is a little different from normal executive protection due to the raised profiles of the clients. It is more likely that a VIP or celebrity will be recognized in a situation that could potentially put them in harm’s way. This is why our executive specialists have been trained – to specifically handle situations with VIP or celebrity clients. This includes scenarios such as crowd control, paparazzi deterrence, stalker protection, and many other potential risks that are inherent to VIP/celebrity protection and transportation. Our specialists can foresee potential issues and mitigate most risks before they become an issue. High-class business executives and government officials often require special protection services during their travels. This is why Transekur security specialists have been trained to provide highly advanced executive and government official protection services. We are able to safely and comfortably transport even the highest-level officials while reducing the risk of attack or danger to an absolute minimum. Transekur security specialists are experts in discrete transportation, decoy convoys, route scouting, and many other security techniques that are important for keeping executive and government officials safe during their transportation throughout the country. It is not always appropriate or possible for our security professionals to walk around visibly armed. This means that occasionally Transekur executive protection specialists need to be ready to provide top level security without the use of weapons. This is why our staff are expertly trained in unarmed combat so that they are prepared for any situation that may arise. Every security specialist is capable and experienced in a variety of close combat fighting techniques and mixed martial arts that can be used extremely effectively for taking out a potential threat in a quick and secure manner. One of the biggest threats that can arise during executive transportation Dominican Republic is the threat of an assailant with a weapon. Transekur’s security specialists are all trained in weapons disarming in order to minimize that risk. They know how to respond quickly to a situation as it arises, and they are able to debilitate an assailant with a variety of specialized techniques that have been proven to work effectively. Our specialists are also able to recognize when someone may have a concealed weapon, which enables them to take action before a threat becomes elevated. In the unlikely event that something does happen which causes injury to one of our clients, all of our security specialists have first aid kits on hand and in every vehicle. This enables us to respond quickly and directly on site to any injury that requires medical attention. This reduces or possibly eliminates transportation time to a hospital, and increases the chances of our client getting the help they need immediately. One of the most important aspects of first aid is the ability to respond quickly to an injury, and our elite training ensures that executive protection Dominican Republic specialists can respond to any type of injury as soon as it occurs. The driving conditions in the Dominican Republic are different than many other places in the world. There are different types of road hazards and potential dangers that exist in the Dominican Republic that do not necessarily exist anywhere else. This is why it is so important for our all of our drivers and security specialists to be trained in defensive and offensive driving techniques. Each one of our drivers is specially trained to handle all of the potential risks of the road within the country. Not only can they take defensive and precautionary moves to keep our clients safe from other reckless drivers, but our drivers can also employ particular offensive driving techniques used deter assailants or escape from potentially dangerous situations. Risk assessment is one of the most important components of the executive protection Dominican Republic training for our specialists. If it is possible to avoid a risk, this is always more effective than trying to deal with a bad situation. Transekur’s security specialists have been trained to analyze a situation and predict any possible risks that could happen during the scenario. Based on this analysis, the security specialists can make a calculated risk assessment to determine whether or not it is safe to proceed. They can also prepare a variety of mitigation efforts so that they can respond accordingly and quickly to any predicted risk. As with all good security measures, prevention is extremely important. All of our executive protection Dominican Republic specialists are well versed in dispute resolution in order to de-escalate a situation before it turns into a far more dangerous situation. One of the best ways to keep everyone safe is to avoid conflict before it happens. Transekur’s security specialists are trained in a variety of techniques and negotiation methods that are designed to minimize the potential of conflict and reduce tension in a discussion. This is particularly important in situations such as car collisions, accidents, or other scenarios that put our clients in conflict. Anti-terrorism training is particularly important for our executive transportation Dominican Republic services. This is because VIP, executive and government official clients are particularly vulnerable to terrorist attacks. Our security specialists are trained to respond to a terrorist attack with the protection of our clients as the highest priority. Transekur is able to evacuate our clients quickly and safely by removing them from the vicinity through a series of specialized training procedures designed to maximize safety and minimize risk during a terrorist attack. Terrorist attacks are difficult to predict, but the ability to respond promptly and efficiently makes all the difference in maintaining security despite such an event. Businesses and members of government may require executive transportation in Punta Cana or executive transportation in Santo Domingo for a variety of reasons, but regardless of the purpose of the trip, luxury and security are two of Transekur’s top priorities for every single ride. Business and government transportation are often required for important meetings, conferences of all types, staff retreats, and other critical work functions that require our clients to move from one place to another in the Dominican Republic. Whether it is a high-level executive luncheon or another important function, Transekur is there to provide secure and comfortable executive transportation wherever and whenever it is needed. Often, our clients need to make multiple stops throughout their trip. When a company needs transportation to take its CEO and staff from a morning business meeting to a conference luncheon, and then on to an afternoon round of golf, they need a company that is always reliable and secure for all their executive transportation Dominican Republic needs. This is because a trip with Transekur is never over until everyone has arrived home safely. A trip with Transekur is also never complete unless it has been one of the most comfortable rides of our client’s lives. Even at the end of the day, after a staff retreat at a beautiful resort, Transekur is waiting on standby to help everyone reach their final destination with comfort and security. There is no need to wait for Transekur as we will be the ones doing the waiting on you. We are always ready to help our clients complete their trips around the Dominican Republic. From the airport and back, Transekur provides the best in executive transportation in the Dominican Republic. Through an agreement with one of the leading executive protection companies in the Dominican Republic, Transekur offers fully trained security professionals, with extensive and continual training throughout the year. 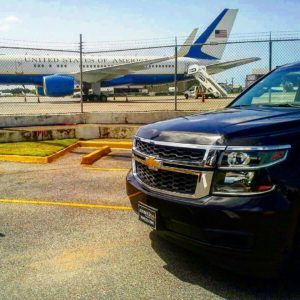 Our executive protection and executive transportation services in the Dominican Republic have been widely used by over 100 multinational corporations, high profile executives, NGOs, diplomats and artists. Along with our premium transportation fleet of vehicles, Transekur offers a series of services to suit your transportation and protection needs in the country. Contact or call us now for a full, detailed executive protection and transportation proposal.